True to the Bible text. Children read the poems and learn the Bible. Entertaining and educational for adults as well. We will be adding picture illustrations. Free to churches, schools and you! Copyrighted to protect integrity. To use free, credit Bible In Poems and do not modify. 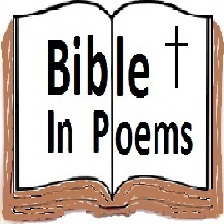 Optional...When you share Bible In Poems please let us know using the feedback button below. 082 - Will Jonathan Die? 099 - Will David Build God's House? A brother and a brother. Twins of the same mother. Known as Esau and then Jacob by his name. Though each boy was a brother, they were different from each other. In most respects they really weren't the same. Esau born first red and hairy. Jacob followed close behind. Jacob came out second grabbing Esau's heel. Esau was a mighty hunter, while Jacob stayed at home. Mom love Jacob, Dad loved Esau's tasty meal. One day Esau came from hunting, unsuccessful he was faint. He'd caught nothing so he had no food to eat. When he came home he found Jacob, cooking up a stew. He cried Jacob, I'm so hungry. Give me meat. Jacob said I'll make a trade, I will give you what I've made, but my pottage it will cost you your birthright. Esau gasp my birthright's worthless. I'm so hungry I will die. And so Jacob had the birthright by that night. It's funny how God works. He must laugh every day. .. I'm sure He knew we'd bring him joy, when He made us out of clay. ..
Pharaoh's command, take the baby boys and throw them in the water. ..
God plan in spite of the King's command, this one's for the Pharaoh's daughter! .. While he was trying to stop Hebrews from becoming number one. ..
God caused the strongest of them all to be Pharaoh's own grandson! ..
Moses saw an Egyptian, beating a Hebrew man. ..
Now big and strong, he slew the Egyptian, and hid him in the sand. .. When Moses went out the second day and saw two of his own people fight. .. He stopped and scolded them. One said, what gives you the right, ..
to judge over us, will you kill me, like the Egyptian yesterday? ..
Moses was shocked that people knew. He had to run away. .. If Pharaoh found that Moses had killed, one of Pharaoh's men, ..
imagine how angry he would be. Moses fled to Midian. .. He met some shepherd girls. A priest had seven daughters. .. They were trying to give their sheep a drink, but men kept them from the waters. ..
Moses ran off the men. He drew from the well. They wondered why he'd bother. .. He watered our sheep. Kept the bad guys away, they excitedly told their father. ..
That's good said dad, but where is he? After all that, you left the man? ..
Now find him and ask him to dinner. Maybe he would be part of our clan. .. So Moses lived with Jethro the priest. All happened 'cause he gave them water. ..
Jethro like Moses very much. Moses married Zipporah his daughter. ..
Well the Pharaoh died. Egypt had a new king. Beat the Hebrews with scourge and rod. ..
As Moses cared for Jethro's flock, he heard the voice of God. ..
A bush burned in the desert with fire blazing hot. ..
Moses saw the flame and he saw the bush, but the fire burned it not. ..
Moses went aside to see it. God said, you're on holy ground. .. Put off your shoes from off your feet. Afraid, Moses turned around. ..
God continued, I've seen the affliction, of my people on Egypt's sand. .. I'll give them the land, promised to Abraham, and I'll do it by your hand. ..